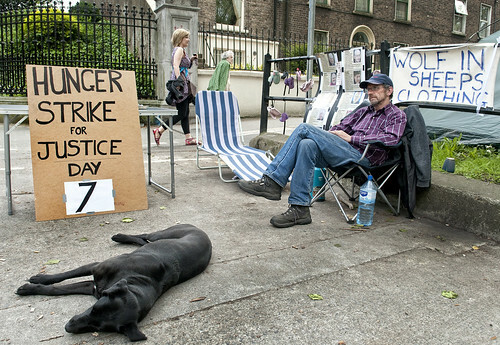 Abuse survivor John Ayres is on the 7th day of his hunger strike outside the residence of Archbishop of Dublin. He demands criminal investigation into child abuse cases and prosecution of those who are responsible for abuse and later cover up. Abuse survivor John Ayres is on the 7th day of his hunger strike outside the residence of Archbishop of Dublin. He demands criminal investigation into child abuse cases and to prosecution of those who are responsible for abuse and a later cover up. Children’s shoes were placed on the railings surrounding the residence of Archbishop of Dublin to symbolize the suffering of child abuse victims.